Everybody’s favorite French cross-dressing revolution-fighting knight is back! It’s Le Chevalier d’Eon! This time, with more wigs. The story for the manga version of Chevalier is quite different from the anime version, at least, from what I’ve seen of the anime (the first volume). In the manga, d’Eon is still a secret knight for King Louis the XV, but the mood and storyline are somewhat different. d’Eon fights supernatural “poets” who use virgins’ blood to write their “poems.” These poems give the poets the ability to transform into monsters. Monarchy revolting monsters! At least, that’s what I’m getting from reading the manga. The manga hardly explains anything. There’s so explanation for why d’Eon gets possessed by his sister, transforming in to Chevalier Sphinx. There’s no explanation of what the poets really want to do, or where they’re coming from. I suppose things might get explained later on, but for now you’re just thrown into the middle of the story. Le Chevalier is all about the action. This is in pretty strong contrast to the anime, which featured a lot of talking and plotting. Each chapter has d’Eon getting into some kind of fight with a poet turned monster. Maybe a little is revealed about the poets, but most of the pages are used for elaborate fight sequences. This is not necessarily a bad thing. It makes the manga super fast to read, unless you like poring over the detail of the art. Also, I’m very happy that the manga isn’t just a word for word mangafication of the anime (or vice versa). There’s nothing worse than seeing an anime, then reading it all over again in the manga. The first thing I noticed reading this manga was the art. It’s different from just about any manga I’ve read. The artwork is full of bold and sketchy lines. There are very few gradients; everything is either black or white. It looks cool. I’d say that the art looked like it came from another country like Korea. It definitely contains influences from something other than just traditional Japanese manga. In typical Del Rey fashion, there’s a lot of translator notes in the back of the book. The funny thing is that the notes are for French culture and biblical references, not the typical Japanese culture ones. They’re helpful for those of us to didn’t pay attention in history and English class. The Chevalier d’Eon manga is a lot more styled and action-oriented than its anime counterpart. It’s nice to see a difference in the two adaptations. I enjoyed reading it, mostly due to the sweet art, but I can’t say it’d be on my must read list. French revolutionary period stuff kinda bores me, even if it does contain monsters. 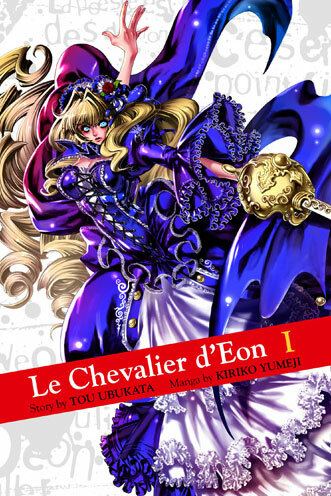 Many thanks to Del Rey Manga for sending me a review copy of Le Chevalier d’Eon Volume 1! I just read this manga, and I found the rough, bold-and-sketchy style to be a nice change from typical action-oriented art. All in all, I’m interested in reading more…If for no other reason, but to get some background details on the story, like the origin of the Chevalier Sphinx and the poet cult. Thanks for your even-handed review! Youre so cool! I dont suppose Ive read anything like this before. So good to search out anyone with some unique ideas on this subject. realy thanks for beginning this up. this website is something that’s wanted on the web, someone with a little originality. helpful job for bringing one thing new to the internet!